It’s spring time, and we start to come out of our winter hibernation and think about doing a little more exercise. 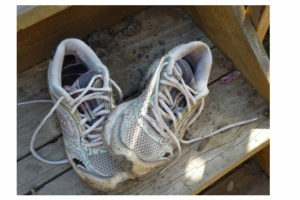 We grab our shoes, put them on and start exercising without giving it a second thought. But, did you know that worn shoes are a leading contributor to foot and leg complaints. We all know we need to replace our runners, like any footwear, but how do we know when to do it? When you’re sporting a nice hole in the sole or your toe is sticking out is a good sign. However, these aren’t the only signs that your footwear may be ready for the rubbish bin. Place your shoes on a flat surface. If they wobble for a while and then settle then this is a good indication you need a new pair. Not only this but if you see when the shoe settles it is leaning to one side, then you may have worn the sole away too much to continue to use them. Runners should bend forward only under the ball of your foot. They should not be easily bent backwards under sole of the shoe, in the middle or at any other site. If your runners are too “bendy”, it’s time for a new set. If your runners are new and bend where they shouldn’t, this may indicate they aren’t of great quality and could damage your feet. You should never be sporting a hole at any site on your shoes. If you find your toe is popping out to say hello or you’re feeling the ground a little too much under your feet, this is a very good indication you are in the market for a new pair of shoes. The back of a shoe can provide your feet with a lot of support and control. Not undoing your shoelaces when slipping your shoes on and/or stomping on the backs of them can crush or bent this area beyond return. In this case, best to stomp off to get a new pair. If you’re finding you’re spending more money on your shoes than Imelda Marcos as they’re wearing out too quick, it’s time to get your shoes looked at by a professional. Even if your runners pass the above tests, they can still be “worn out” or incorrect for your feet. They could be the cause of any foot pain or could lead to a problem occuring. If you have foot or leg pain, it’s time to see a Podiatrist. Feetology Podiatry Centre’s Podiatrists can assess if your footwear are excessively worn and if this is occurring too quickly. They can answer your footwear questions and provide custom footwear assessment and suggestions to get the best shoes for your feet. Don’t let your shoes spoil a good day out. Call Feetology on 07 38206326 or book online. This entry was posted in Blog Posts on September 28, 2018 by Feetology.